I guess I have a job to do. As the Chief Irritant on this quirky little island, I've noticed that the Monarch Butterflies are flying around the neighborhood. The windows were open most of last week, it's our secret season. A Secret because we've all kept our yap shut over just how beautiful March in South Florida can be. It can also be near the 90s and humid so when it's this nice we'll just take advantage of it. I got growled at one day for keeping the windows shut and the air conditioning on. In March. It was more due to the fact that it was in the mid 70s outside and beautiful. My tolerance for a warm house is pretty high, and as long as there's a breeze going through I don't notice until the indoors are into the low 80s. I had the air conditioning off that morning and being a house made of concrete blocks, the cool will stay inside for a while. The house hadn't warmed up yet as a result. Sitting in my comfy bouncy Poang chair, I was watching as one after another Monarch Butterfly would float past the front windows of the house. The breezes were gentle and off the ocean. They would later switch to be a land breeze. When that happens, the palm trees flop over to the East and I know that a front would be coming through. But for today the conditions were right for my orange and black Monarchs to windsurf past the window. Time to open the house up anyway. I had noticed that the Mexican Milkweeds that I had in the yard were eaten down to a stick, which might explain why the Monarchs were back. Around the corner and down the way, the Mexican Milkweeds had ripened and the seed pods burst. So I have a job to do. Grab one of those pods and be Johnny Milkweed Seed again. There's a little bit of open land near the river that needs a few flowers. Not that anyone asked me to, but as Chief Irritant, one of my responsibilities is to make sure that the world is safe for future butterflies. Plus I need a few seeds for the back yard as well. They always seem to turn mine into sticks, and it is a rare plant that gets as far as going to seed. The ones here are some of the Monarchs that will begin to migrate North. In a month or two they will be up near the big Cities, and in two they will make it as far as Canada. We will still have a few. They will dance on the breezes past my window and rise on thermals in small spirals over the flowers in the park. But they will need places to lay their eggs so future generations will make the trek North to delight people as they float past their windows in places that they can't overwinter. 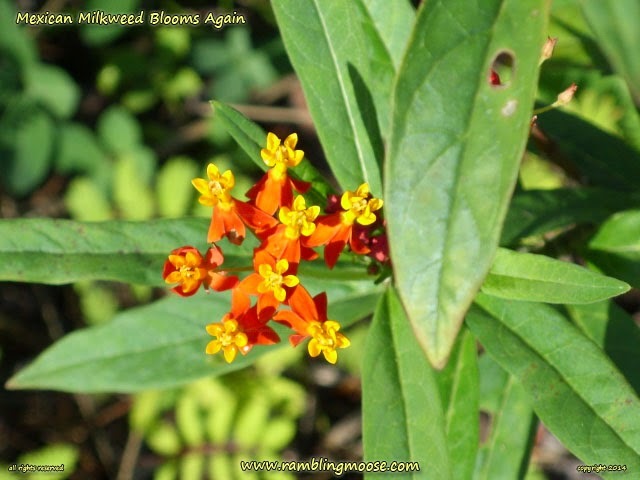 Somewhere up North in a month or two, someone will look out at their garden, notice their own Milkweed has opened up and is beginning to set forth silver starbursts of fluff on the breezes to make those same homes. They will grab a few seeds to scatter and pay it forward for the little creatures to find later. The cycle of butterflies. They could use a little help now and again. After all, Canada is a long way away from South Florida.